An ardent and tireless missionary, he saved countless souls and healed many of the sick and lame. By the love and grace of God he persevered in his life of love and sacrifice to the end and died in the scent of sanctity. Some nine months before the Declaration of Independence was signed, St. Paul of the Cross died the death of a saint, after spending eighty years in the service of Christ. Born in Ovada, Italy the third of January 1694, he demonstrated a pronounced disposition toward prayer and virtue at a very tender age. His favorite meditation was the crucifix. By the time he was twenty-five, he was sufficiently advanced in sanctity to be blessed with a vision in which he saw himself clothed in the habit still worn today by the Passionist Order. From that time on he felt an ardent desire to found a new congregation. In November 1720, his Bishop clothed St. Paul in a habit similar to that of his vision, and soon began writing the rules for his new congregation. A formidable, and usually quite lengthy task subject to repeated changes by the Holy See, St. Paul’s Rule of the Congregation of Passionists was approved in a relatively short time and with very few modifications. Ordained to the priesthood by Pope Benedict XIII, St. Paul was granted permission to found his new Congregation by the same pope. By September 1737, the first Monastery of the new Congregation was solemnly dedicated at Monte Argentaro, Italy. 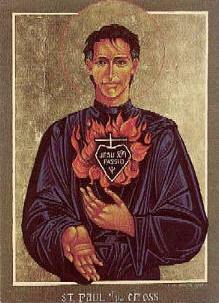 His zeal for souls and his indefatigable labors and sacrifices brought him extraordinary graces and through him God wrought many miracles. An ardent and tireless missionary, he saved countless souls and healed many of the sick and lame. By the love and grace of God he persevered in his life of love and sacrifice to the end and died in the scent of sanctity. Once a sleepy olive grove on 10 acres of land in La Mirada, St. Paul of the Cross has become a thriving Catholic parish and school of more than 1,400 families since established by James Francis Cardinal McIntyre on May 4, 1956. Shepherding our flock in the beginning was Father Owen P. Jinks. Under his guidance, St. Paul flourished into an active, viable faith community boasting numerous parish organizations and an elementary school. In June, 1956 the first religious summer school was held and resulted in a First Holy Communion class of 21 children in July. By August, a residence on Mansa Drive was purchased and became the first rectory. The garage was converted into a chapel where weekday Mass was offered. 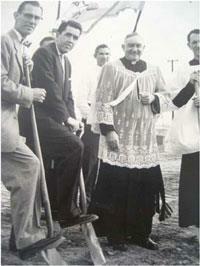 On February 10, 1957, ground was broken to start the new parish plant. On August 26, 1957, four nuns of the Bernadine Sisters of the Order of Saint Francis arrived. After much difficulty, due to construction delays, 379 children answered the first bell on September 23rd. Shortly thereafter, the convent was completed and the nuns moved into their new home. Father Jinks offered the first Mass in the new church on All Saints’ Day, November 1, 1957. Following, Bishop Timothy Manning conferred the Sacrament of Confirmation upon 49 adults and 90 children on January 26, 1958. On September 28, 1958, Cardinal McIntyre dedicated our church. A Mass of Thanksgiving marking the 25th anniversary was celebrated by Cardinal Manning on April 26, 1981. Our school was served by the Bernadine Franciscan Sisters for more than forty years. Our last sister to serve at St. Paul of the Cross School relocated in June, 1999.